This 3-D sunflower metal wall sculpture, as pictured below, is in many ways similar to the fun hologram stickers that so enthralled children a decade ago. Using special RefraXion lines which combine light with dimension, the wall art sculpture slightly changes the appearance of the sunflower from different angles of viewing. Unlike with most other sculptures and art pieces, this one is dynamic in its visual appearance. The sunflower is a very popular flower for use in decorative art pieces. This comes as no surprise for the flower is beautiful, eye-catching and decidedly recognisable. Within the sunflower itself is a flying wasp (or bee) whilst surrounding the petals is a delightfully intricate leaf framework. The entire piece is delicate and floral in its theme and will sit well on a wall which needs some nature-based additions. The circular frame gives it a lovely completed look and hints at the shape of a wreath or garland. 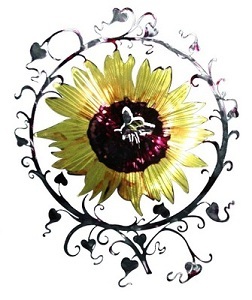 The 3-D yellow sunflower metal wall sculpture is made from steel and changes appearance slightly as you move from one area of a room to another. The RefraXion special effect also takes place in different lighting. This means that as the hours of the day change, the appearance of the sunflower sculpture will also vary. Most décor in the home does not change much from one hour to another or from one day to the next. However, this sunflower sculpture does have a fluctuating ambiance to it and will provide an ever changing feature to an interior in which it is placed. 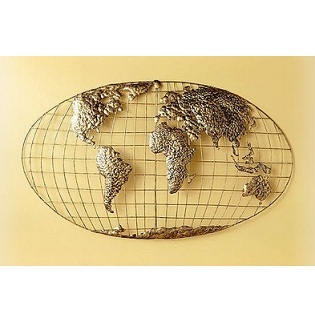 You can buy it from here: 3D Sunflower RefraXions Metal Wall Art.